Scrambled eggs are a protein-rich breakfast dish made from eggs. The eggs are heated gently all the while they are stirred or beaten together in a pan. To season scrambled eggs use salt or sugar as a child I always ate with sugar it is only now that I have started using salt and pepper. Eggs are the easiest to cook and they are healthy too. Eggs can meet your protein needs especially if you are on a budget. This week I am cooking up some eggs, my daughter has shifted out to Bangalore and she is going to cook. Since she does not enjoy cooking eggs will be her mainstay. Main ingredients to make scrambled eggs you need only eggs, salt, use one or all of the following milk, and butter, cream, grated cheese. Use ground pepper to season the eggs they taste better. There is a shortcut or a lesser vessel for you to wash Apeksha, if you crack the eggs directly in the pan you want to scramble the egg add butter, salt, pepper. Mix or stir the eggs then transfer to heat and cook stirring continuously. Turn down the heat as they cook this gives this creates small, soft curds of egg. Remember scrambled egg is never browned. Let the liquid almost finish add the other ingredients herbs, cheese or cream and yes Apeksha you may add ham too here. Fold over low heat until incorporated. Remove from heat. It is better that the scrambled eggs are cooked a bit less yes they are better a bit undercooked as the egg will continue to set. If any liquid is seeping from the eggs (syneresis), this is a sign of undercooking, overcooking or adding undercooked high-moisture vegetables. The other Egg Recipes simple enough for you to make are Bhuna Masala Egg Curry, Devilled Eggs/Deviled Eggs/Eggs Mimosa, Anda Bhurji Wraps/ Scrambled Eggs Wrap ~Indian style, F for Fried Eggs, Egg Chat. The recipe below is the basic one you can add ingredients as you want. Also, I know Apeksha that you have puckered your nose at the thought of milk but use it you need the calcium milk provides. Protein-Rich Scrambled eggs a great start of the day! In a bowl, crack open the eggs, add the milk, salt and pepper. Use a fork or a spring whisk to beat the eggs. The longer you beat them the softer and lighter they become. Grease the pan before you heat it. Simpler and less painful. Add the beaten egg mixture and transfer to low heat. Let the liquid almost finish add the other ingredients herbs, cheese or cream and ham too here. Fold over low heat until incorporated. Remove from heat. The eggs will be underdone but they will continue to cook and set. One of the easiest way to prepare eggs and one of my frequently made dishes. Looks good. I am curious about how they taste with sugar.. I thought it was potato Arch, good one..Nice to know Apeksha has relocated and will be exploring the world!.. this is so good for egg lovers 🙂 good luck to ur elder one and her future too ! Simple yet filling and healthy protein rich breakfast. 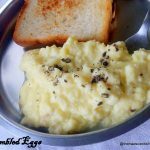 Scrambled eggs with cheese and milk looks sinful..
A great post for all those young ones who want to cook and yet not spend too much time near the stove. Perfect protein rich breakfast. Wow! Never tried scrambled eggs with sugar…maybe that could make my daughter like it! Cool idea! I can turn almost all egg recipes into pure vegetarian ! 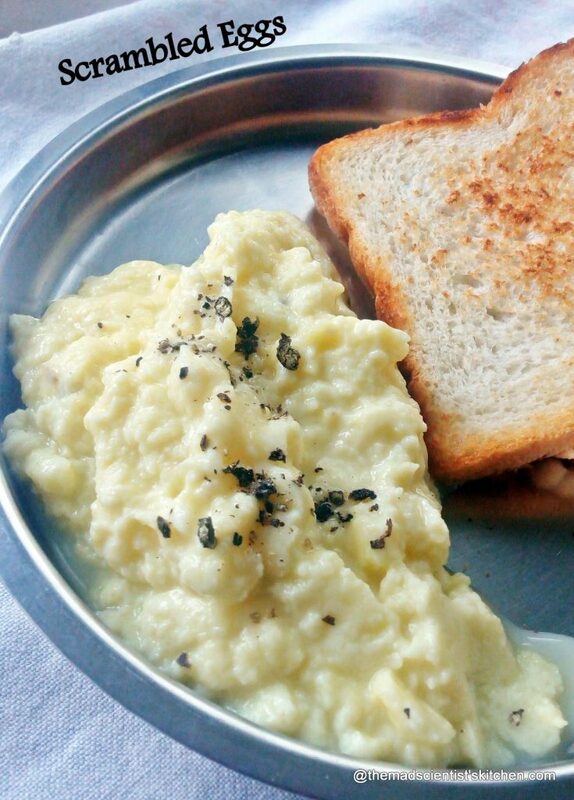 The scrambled eggs can be scrambled paneer ! This is one of the simplest forms of eggs and I am sure makes a great breakfast or a brunch ! 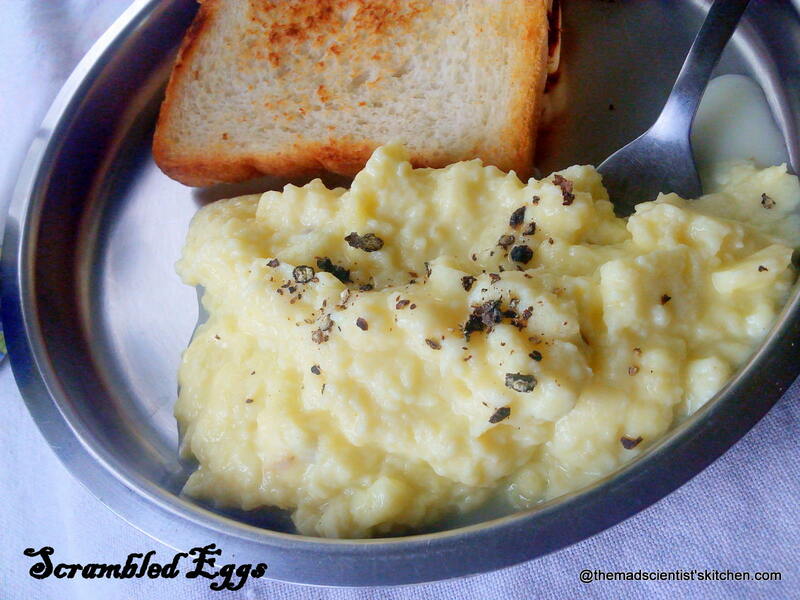 Excellent breakfast, this scrambled eggs with toasted bread will definitely please anyone’s tastebuds. Even when i started cooking i used to cook eggs for breakfast on 5 days a week. Easy yo cook and i find it less messy too.